This page discusses the general policies concerning attendance and how you build your own attendance grade. Of greater interest to most people is the detailed description of how to make up missing work and/or receive extra credit. Make ups and extra credit are described in detail on this page because all make up and extra credit work applies to your attendance grade. What are the basics of the attendance grade? Attendance in this course and section is very important. Why? Much of what you learn will be developed through your interactions with others. That is what much of this course and section is about: expressing your ideas, giving feedback to others, and getting it from them. When I was in my second semester as a freshman in college, I developed a rule of thumb for my own attendance: no more than three times per course during the semester. I developed this rule of thumb because I had a disastrous attendance record my first semester--and pretty bad grades, as a result. (I also learned to sit up front, even though I preferred sitting in back: those who sit in front get noticed more by the teacher and are more likely to answer the teacher's questions.) If you do miss, however, I allow for make-up work amounting to twice as much time as the time you missed. Each week, we have the equivalent of four classes. Each one is 50 min. long. Two are on Tuesday, and two are on Thursday. Attendance is worth 33 points/X's. There are a total of 100+ points/X's possible in the course: attendance, 33 pts./X's; weekly papers, 67 pts./X's; and participation/improvement (up or down up to one letter grade). Extra credit--mainly for attendance but also for an extra Draft 4--also is possible. See the "Grading" page in this Web site for more details. And for attendance extra credit, see below. Anyone going 2 weeks with no attendance activity will be dropped from the class. "Students are expected to attend all sessions of each class in which they are enrolled. If an illness or emergency results in an absence, students should meet with their instructors to determine if missed work can be completed. A student may receive a course grade of FN or NC after two consecutive weeks (or equivalent in accelerated courses/terms) of unexcused absence at any time during the semester. Students who receive and FN grade may request to have their grade changed to a W (withdraw) if done so by the course’s withdrawal deadline. Class attendance is defined as being physically present in the classroom. Online attendance is defined as having submitted an assignment, taken a quiz, or posted/made a course content-related comment on the discussion/chat board for the course in which the student is registered." "Subpart A. Last date of attendance: Instructors issue a grade of FN for students who never attend class or stop coming to class. If a student misses two weeks of class (or equivalent in accelerated courses/terms), instructors may report a last date of attendance and issue a grade of FN. The FN grade is punitive because it counts against both GPA and completion rate." "Subpart B. Academic calendar: PSEO students and students enrolled at other colleges must follow the Inver Hills official academic calendar as it relates to their attendance and registration at Inver Hills. Term breaks, holidays, and non-class days at other institutions and vacations do not supersede the Inver Hills requirements or academic calendar." How can you do make ups & extra credit for attendance? You may complete extra work for make-up/extra credit. It counts as part of your attendance credit because you report how long you spent--how many minutes and/or hours. It first counts towards missing attendance, and after that as extra attendance. However, no matter how it is counted, it all goes toward the X's/point system for the course, thus raising your grade. You may get as many extra X's/points as you want in this way. Note: No make ups are allowed for missed homework writing assignments (unless you miss class, in which case you may always turn in homework the next time you come, and it will be considered as on time). However, you can counterbalance a poor homework grade by earning extra credit for attendance, so that your attendance points/X's go to as high a number as you want. The most basic way to earn attendance credit is simply to attend. Otherwise, you may use any of the methods below for attendance make-up and/or extra credit. Extra credit almost always is listed in attendance, but it does boost your total number of X's/points, so it doesn't matter where you get the credit: it all goes to the same total of points/X's. Here are the activities and papers you can use for make up of attendance and extra credit. 2a. 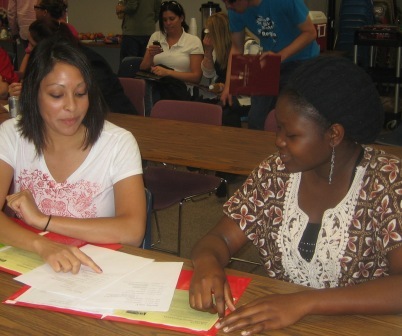 From IHCC, Tutoring Alternative: You may get credit for missed time in class by working with a tutor. (You have to actually work with the tutor, not just sit in the tutoring center. Online tutoring also is available.) See https://www.inverhills.edu/StudentResources/WritingCenter/. You should use an official IHCC tutor in the IHCC Writing Center (a large, open space in the middle of the 2nd floor of the Library building) or a parent, former teacher, friend, or classmate who can actualy offer you some real help. Be sure to have the tutor sign one of our class tutoring forms/slips, or some other paper stating how much time he or she spent working with you. 2b. From IHCC Library Research Tutorial: The IHCC Library says, "The Library has an online tutorial to help students understand academic research and guide them through using college library resources. The tutorial has 6 modules, each with an explanation, exercises or games for practice, and a quiz. There are also pre- and post tests for the entire content of the tutorial. Each module can stand on its own or you can have students do all 6. In module 5, Using the Web, [is] a box with links to identifying and fact-checking Fake News." This was added "[w]ith the permission of the Indiana University East librarians....". A. Films: Use movies only from the approved lists in www.richard.jewell.net/1140/Books&Webs.htm#Movies. They are for a literature class, but they also have mythic themes. If you think you've found another movie not on the list that might qualify, ask me about it. Write about each film for 400+ words, analyzing it from three specific theories/sub-theories or point(s) of view, or dialoguing about it using, equally, two opposing arguments and a compromise or higher position about an issue in the film. Turn it in with the amount of time you spent watching and writing. B. Web Sites: Go to www.richard.jewell.net/1114/Textbooks&Resources.htm and click on "ADDITIONAL ONLINE SOURCES." Write about the websites you visit and what they have, state the time you spent viewing and writing, and turn it in. C. Books: Use only books from the approved lists of the first and second reading books. (You may not count the book that you are choosing as your second required reading book for the semester.) Write about what you read for 200+ words for every 30-40 pp. of reading, state your reading and writing time, and turn it in. Summarize the film (or book or web site). Write an "Analysis" of it using three theories (or three sub-parts of one theory) or three points of view. Write a "Dialogic" paper about it using three positions: two opposing ones and one compromise or higher position. § What was the basic point, argument, story line, plot, or narrative line of the book or web (in a sentence or a paragraph)? § Who were the main people? § When and where did it happen? Are the times and places significant? § How or why did the main event(s) happen? What are some causes and effects? § What was the high point or best part of the film, book, or web site for you? Why/how? § What was the low point of it for you? Why/how? § Who would be the best audience for this book or web site (and/or the worst audience)? § What do you think is the "moral of the story"--or point to get out of it--of this book, or web site: what should people learn or take home from it? Why? § How would you rate this book or web site on a scale of four stars? Why? Would you give a different rating if you were doing it for a wider audience? If so, why or how? 4. Tutoring by or of a Classmate (counts as 1 for 1: 1 hr. of this activity = 1 hr. of missed class or extra credit): You may get credit for missed time in class by working with a classmate for the same amount as the time you want to make up. (You have to actually tutor or be tutored by the other person, not just sit with them and study or write.) If you are being tutored by someone else, they must actually know what they are doing regarding that particular activity or assignment in the course. And if you are the person who is doing the tutoring, you must know what you are doing regarding that particular activity or assignment in the course. Report to me the actual amount of time you were tutored/tutoring so that I can give you the proper credit. 6. You may also write sentences using the Merriam-Webster "Word for the Day" Web site, full value, 1 for 1: do this alternative writing assignment for an equal amount of class time. Use each word in a sentence. You may write up to ten different sentences using one word up to ten times (once or more per sent. ), and you may write as many current or past "words for the day" as you want. Show me what you've written with a statement of how much time you spent writing the words and their sentences. Go to http://www.m-w.com/cgi-bin/mwwod.pl. 9. Combination of the previous two items, above (counts as 1 hr. for 1 hr. ): Read a chapter, take notes on it, and use its directions to write a paper, as described in both "Duscussion of 1 or More Textbook Chapters" and "Paper from a New Textbook Chapter," above. Count your time for all three of these activities, and turn in to me what you've written, along with the total amount of time you spent. .
10. Resume and Cover Letter (counts as 1 hr. for 1 hr. ): Imagine you're applying for a job in your future profession. Neatly type both a resume and a cover letter. (This may be entirely real or partly made up.) The resume can use any of several different organizational methods: e.g., the "targeted" resume, which emphasizes special experiences or training you have; the "time" resume, which shows what you've done in order of time (usually from most recent to oldest); or the most common, a "subject" resume, which shows your activities by subject (e.g., "Job Goals," "Paid Positions," "Volunteer Work," Education and Training," and "Other" or "Personal Information." Most commonly, people do some combination of two or three of these types. The cover letter should be sincere and contain a brief introductory statement of the job you are interested in (pretend if need be) and the fact that your resume is enclosed. There should be a good paragraph or two on why you are appropriate for the job--something not in your resume. And there should also be a paragraph describing why you picked this particular company or place--what's so good about them that attracted you to them? There should then be a brief closing paragraph describing where and how to reach you and expressing your sincere hopes about being hired. 17. Other Writing--Personal, Creative, or Other--Anything Not Assigned for Another Class or at Your Job (counts for only 1/2 the time spent). You may get credit by creating non-class writing in the current semester. Personal or creative writing--as in letters, journals, diaries, stories, etc.--can count. However, they must have been done in the same semester as our class. And you cannot count writing done for other classes or for a job. You also may not count time spent in reading and/or research--just actual writing time. Simply state your writing time on the front and label the writing as "Extra Credit--Written During This Term," and turn it in. 18. Writing Done for Other Classes or Work During This Same Term. You may get 1/4th credit for other writing you have done for classes and/or for your job this term. Show me the work and put the total number of hrs. you worked on it at the top--the actual hrs. of writing (do not count researching or reading time). 1. Read this page carefully: understanding attendance policies and minimums. this is the most important process you can perform at the beginning of any class: figure out exactly what you need to do to get the grade you choose. In future weeks, come back to this page whenever you are interested in doing something for extra credit and/or make up. 2. Class Counts for Grade & Gives Info: Coming to class regularly is necessary for most people, especially in the first eight or nine weeks, because in class you learn the required types of papers in detail. If you do miss class, you can make it up in a number of ways: see below, Make Ups - Extra Credit. 3. Basics of Attendance Marks: Attendance for the on-campus, face-to-face classes is taken in class at the beginning of each class session. If you are more than ten minutes late or leave more than 10 minutes early, you receive 1/2 credit for that hour. Most attendance in class is worth 1 point or 1 X; however, later in the term, library trips may be worth only 1/2 X or point per class. Attendance for any online class is taken on the web, either full credit for all work or 1/2 credit for 1/2 of the work. This page describes attendance and make up/extra-credit policies.